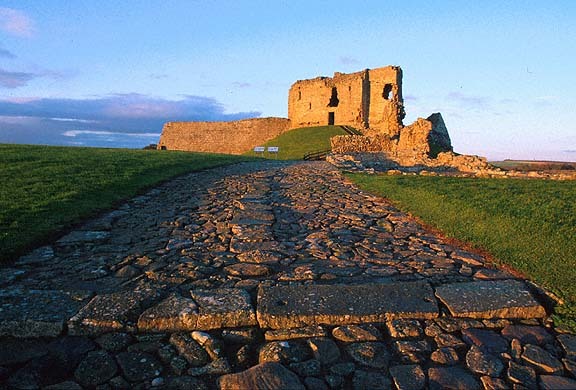 Duffus Castle served as a fortress-residence for over five hundred years. During that time the place underwent great changes, none more radical than the replacement of the original earth-and-timber castle by one of stone and lime. When the first castle was built about AD 1150, it was among the foremost defensible strongholds in Scotland. By the time of its abandonment in 1705, the once mighty medieval castle was little more than a decaying fragment of history, completely unsuited as a residence of nobility. The ancient province of Moray, which stretched from the River Spey on the east to Skye in the west, was a major region of the Pictish confederation. At the outset of the 12th century the province was governed by a 'mormaer' or Celtic earl, Angus by name, who in 1057 had succeeded the murdered MacBeth as King of Scots. Fiercely independent and deeply suspicious of the growth of the national monarchy, Angus rose up in revolt in 1130. The rising was firmly quashed by King David I, the earl deposed and his earldom taken into royal hands. King David immediately began to settle the province with men of his own choosing, landlords he could trust to preserve 'the king's peace'. Perhaps the most important newcomer was Freskin, a Flemish soldier of fortune already in possession of an extensive estate in Lothian (Strathbrock, now Uphill). He was encouraged to come north and settle in the lands of Dufus. His son, William, adopted the title 'de Moravia' ('of Moray'), and by 1200, Freskin's descendants had become the most influential house in north Scotland, with kinsmen throughout Strathspey and across the Moray Firth. Freskin built a great earthwork-and-timber castle, called a motte-and-bailey. The motte is a massive mound, entirely man-made, with steep sides and a wide, deep ditch encircling the base. Upon its flat top was his timber residence, further protected by a wooden palisade, or defensive fence, drawn around the edge of the summit. The motte was reached from the bailey, a broad expanse of ground likewise raised above the surrounding land though not as high as the motte, either by a bridge carried over the ditch or by steps climbing the mound. Here were ancillary lodgings and service offices, such as the brewhouse, bakehouse, stables, workshops, and perhaps a chapel, all necessary to maintain the household of a mighty lord. Sadly, none of these structures have survived. About 1270, the direct line of Freskin ended in two heiresses, one of whom married Reginald Cheyne the younger. For a time, the Cheynes became the castle's new owners. But by about 1350 the last Cheyne lord of Duffus had died, leaving the estate to another heiress who married Nicholas, second son of the fourth earl of Sutherland, and so the castle and lordship came once again into the possession of a descendant of Freskin. They remained in the hands of the Sutherlands until sold in 1705. We cannot say with confidence who gave the instruction to rebuild the old timber castle in stone in the 14th century. Neither the architectural detail nor the documentary record is sufficiently explicit for us to be sure. A reference from the year 1305 recording a grant to Reginald Cheyne of 200 oaks from the royal forests of Darnaway 'to build his manor of Dufhous' indicates a major building program underway at that time and it may be that the wood was needed for the flooring and other parts of the emerging stone castle. We know that Cheyne's estate had suffered quite considerable damage during the war of independence with England, then at its height, and it is possible that Reginald Cheyne was putting to rights war damage and taking the opportunity thus presented of building a more impregnable castle of stone. In the new castle the motte continued to support the main residence, now a two-storied rectangular tower presumably with an embattled parapet at the wall top, from which a garrison could defend the castle. The lord's hall was on the first floor, with a latrine and small chambers, possibly used as bed-closets, off it. The ground-floor hall may have been used for storage as well for accommodation for the lord's household. The tower was designed with defense firmly in mind. The windows are small and sparsely set. The one entrance into the ground floor has been protected by a portcullis, a suspended iron grille, raised and lowered from the chamber directly over the doorway. Doors at either end of this front wall give access from the first floor directly on to the wall-walk of the curtain wall. At one time that curtain of stone, punctured by four gateways, three of which survive, had completely enclosed the bailey. There may have been quite a cluster of timber buildings here, now all gone. Along the north side, however, are the vestiges of a stone range that has, in its day, been imposing. It began life as an outer or great hall, a reception suite less restricted than in the main tower, with a kitchen at one end and a more intimate withdrawing room, the great chamber, at the other. This building may have been erected after the Sutherlands became lords of Duffus, certainly the ditch encircling the motte had gone out of commission as a defensive feature for cellars attached to the hall block were built in the bottom of it. The injudicious building of a stone castle upon the old earthworks is self-evident. Quite when the walls started failing is uncertain, but repairs were carried out on certain subsidence fractures before a greater part of the tower slid down the slope. The tower itself shows no signs of later modification and may have been abandoned early as a residence. The stone hall block in the bailey was clearly used after that, for alterations were made to convert part of it into a modest residence. It was probably here, not in the main tower, that Claverhouse dined as a guest of James, lord Duffus, during his lightning campaign that ended at the battle of Killiecrankie in 1689. An elderly woman, alive in 1760, recalled working at the castle as a girl and remembered bringing claret to the table during the dinner, probably one of the last occasions the old castle was used. When James Sutherland built a new house, Duffus House, a short distance away, the castle fell rapidly into decay. Sir Edward Dunbar placed the ruin in state care in 1926. The existing structure is mainly 18th century. In the usual Presbyterian manner, the pulpit was in the middle of the south wall, with galleries around the remaining three sides reached by forestairs against the north and east walls. Within the churchyard, south of the kirk, stands a fine cross, over 4 m high." "Duffus Castle is an almost complete specimen, in stone and mortar, of the basic motte and bailey castle made famous by the Normans. The castle is located a few miles north of Elgin in Morayshire and is said to rise from the otherwise level ground "like a boss on a buckler". The castle was built upon a low natural ridge, which runs nearly north and south, upon which was raised a man-made mound. A great tower was constructed on the mound, rising to three stories. The flooring was entirely of wood, up to a distance of 36 feet, which attests to the abundance of that material in the immediate area. Evidence has been found of a ditch between the mound and the bailey; the ditch being constructed about 14 feet above the bailey and the mound rising 40 feet above the ground level. It is evident that the mound was first constructed for a less weighty building, the original castle being of wood. The result of raising a stone tower on the artificial mound has been that the north western corner of the tower has broken off and slid down, while serious cracks have developed on the south face. Further, the unstable character of the site must have disclosed itself at an early stage as the larger window openings have been contracted as if to reduce the unsupported open spaces. The smaller windows are not the usual slits but are of lancet shape, as if influenced by the architecture of the neighboring Elgin Cathedral. The 'bread chambers' on the windows suggest a construction date well into the 14th century as also do the mural chambers in the front wall. The tower has a sort of 'forework', more in the character of a vestibule, which extends along the greater part of the front towards the bailey. This is roofed with flags, not vaulted. It leads to the stairs on the south. On the north side, there is a 'garderobe closet' with external flue. The entrance to this is now set in a modern re-building and had a portcullis as added protection. The thickness of the castle walls average 7 feet 2 inches but there are sections only 14 inches thick. The bailey enclosure is of quite remarkable character. One considerable stretch of walls, which still survive, show it to have been slightly polygonal in shape without towers of any kind. The wall was not more than 15 feet high and had a wooden parapet walk which could be reached by a door at each end of the tower. The bailey walls are connected to the tower and are probably a later construction. Three entrances, without any special equipment for defense, have been located in the bailey walls. The walls enclosed an area of about one acre. Surrounding the castle is a 25 foot wide ditch which was crossed by a stone bridge. The ditch encloses an area of 8 acres."